Topical aural antibiotic use in the UK – time for a change of policy? Robin Youngs, Edward Fisher, Musheer Hussain, Jonathan Fishman,	The Journal of Laryngology & Otology, Volume 130 Issue 1, p 1. A S Harris, H A Elhassan, E P Flook,	The Journal of Laryngology & Otology, Volume 130 Issue 1, pp 2-7. D S Gogarty, A Shuman, E M O'Sullivan, P Sheahan, J Kinsella, C Timon, J P O'Neill,	The Journal of Laryngology & Otology, Volume 130 Issue 1, pp 8-14. E Fitzgerald, A Perry,	The Journal of Laryngology & Otology, Volume 130 Issue 1, pp 15-20. P Pan, J Huang, C Morioka, G Hathout, S M El-Saden,	The Journal of Laryngology & Otology, Volume 130 Issue 1, pp 21-24. S Degeest, P Corthals, I Dhooge, H Keppler,	The Journal of Laryngology & Otology, Volume 130 Issue 1, pp 25-31. K Badran, S Ansari, R Al Sam, Y Al Husami, A Iyer,	The Journal of Laryngology & Otology, Volume 130 Issue 1, pp 32-37. X Zeng, P Li, Z Li, J Cen, Y Li, G Zhang,	The Journal of Laryngology & Otology, Volume 130 Issue 1, pp 38-41. C-S Lin, Y-S Lin, C-F Liu, S-F Weng, C Lin, B-S Lin,	The Journal of Laryngology & Otology, Volume 130 Issue 1, pp 42-49. 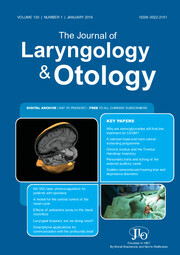 B Yilmaz, F Canan, E Şengül, F E Özkurt, S F Tuna, H Yildirim,	The Journal of Laryngology & Otology, Volume 130 Issue 1, pp 50-55. N F Poole, M K Skilton, T C P Martin, M C F Smith,	The Journal of Laryngology & Otology, Volume 130 Issue 1, pp 56-65. I Z Iqbal, C Watson,	The Journal of Laryngology & Otology, Volume 130 Issue 1, pp 66-68. A K Guidera, L Benoiton, L McManus, P J D Dawes,	The Journal of Laryngology & Otology, Volume 130 Issue 1, pp 69-75. J Zhang, R Qiu, C Wei,	The Journal of Laryngology & Otology, Volume 130 Issue 1, pp 76-81. M Williams, R Eccles,	The Journal of Laryngology & Otology, Volume 130 Issue 1, pp 82-88. R Sun, X-Y Tang, Y Yang,	The Journal of Laryngology & Otology, Volume 130 Issue 1, pp 89-94. F Aksoy, E Senturk, R Doğan, B Veyseller, O Ozturan, N Gönüllü, F Yilmaz,	The Journal of Laryngology & Otology, Volume 130 Issue 1, pp 95-99. S Lim, P Sau, L Cooper, A McPhaden, K MacKenzie,	The Journal of Laryngology & Otology, Volume 130 Issue 1, pp 100-103. F C Lyall, P J Clamp, D Hajioff,	The Journal of Laryngology & Otology, Volume 130 Issue 1, pp 104-106. H Ramotar, L Cheung, L Pitkin,	The Journal of Laryngology & Otology, Volume 130 Issue 1, pp 107-110.